Elizabeth T. Clement, who was snubbed by her own Republican party, and Megan Cavanagh, a Democratic nominee won the seats for highest court. 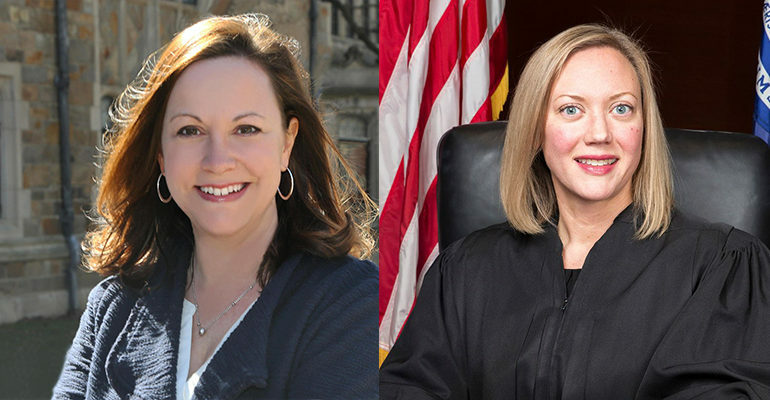 LANSING— Elizabeth T. Clement, who was snubbed by her own Republican party, and Megan Cavanagh, a Democratic nominee for the state’s highest court, rode the pink wave in winning the two seats on the Michigan Supreme Court, which will now have three women and four men deciding cases that affect millions of Michiganders. Cavanagh, a veteran appellate lawyer, came in second. She edged out incumbent Justice Kurtis Wilder by one percentage point, beating him by more than 62,000 votes. Clement was the front-runner in the Supreme Court race, with a commanding lead of 285,000 votes over Cavanagh. Since being appointed to the Supreme Court in 2017 by Gov. Snyder, Clement twice irked Republican officials, most recently when she voted to let Proposal 2 on the ballot, over the objections of those who opposed the redistricting measure. Responding to her critics for breaking from the conservative justices on that vote, Clement said she was guided by the law, not politics. Snyder appointed the two Republican incumbents, Clement and Wilder, to fill vacancies in 2017. Over the past year, they’ve ruled differently on two key issues for Republicans: Gun control and gerrymandering. Clement voted with the majority in upholding the rights of schools to ban guns on school property, while Wilder dissented. In August, Clement again joined the majority on the bench in letting voters decide the gerrymandering issue at the November election. Wilder dissented on that vote, too. Republicans endorsed both Wilder and Clement. However, after Clement cast her vote that put gerrymandering on the ballot, the Republican Party shunned her. In fourth place was Democratic nominee Sam Bagenstos, 48, a University of Michigan law professor and veteran civil rights attorney who served as deputy assistant attorney general for civil rights at the U.S. Department of Justice under President Obama. He won 702,762 votes, which constitute about 11.44 percent of the total. Kerry Lee Morgan, the Libertarian Party nominee, took fifth place with 5.8 percent, or nearly 359,451 votes. Natural Law Party nominee Doug Dern came in sixth with 3.4 percent, or nearly 209,215 votes. The next few years are expected to be crucial for the state high court’s seven justices who will have to decide controversial issues that are sure to impact millions of Michiganders.